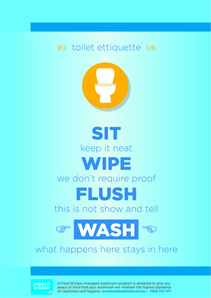 Are you aware of the dos and don’ts associated with workplace bathrooms? Did you know about the negative signals you send out when you fumble over a restroom faux pas? 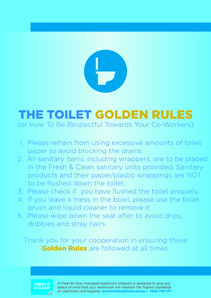 Admittedly, it’s not always obvious and is rarely set out in official memos, but there is a workplace bathroom etiquette that is expected to be followed – the etiquette that plays a very important part of creating a greener, safer and healthier working environment. Good workplace bathroom etiquette is not just about politeness and respect, like saying good morning and keeping a door open to allow someone in or out. This help, of course, but etiquette, in this case, relates to a very specific situation that does not occur anywhere else. It’s designed to prevent embarrassment and awkwardness, show respect and consideration, but also, crucially, reduce the level of bathroom contamination that may render you and your workmates ill.
All the experts agree that proper workplace bathroom etiquette can play a significant role in improving the workplace atmosphere, relationships between workmates and in lowering the risk of infections. After all, the bathroom is one of the most germ-infested places in any building. According to research carried out by the University of Colorado, in the US in 2011, public bathrooms teem with hundreds of different species of bacteria – 230 different species on bathroom floors alone with 150 species found on other surfaces. Not only that, but bacteria spread extremely fast in enclosed areas used by multiple people, like a workplace bathroom. Research carried out by Dr. Charles Gerba, microbiology professor at the University of Arizona, looked at the extent to which bacteria can spread. This research discovered that it took between 2 and 4 hours for the bacteria to spread over 60% of frequently handled surfaces. Think door handles, sink edges and flush handles and such. Moreover, after 8 hours, practically 100% of surfaces were contaminated. We know that the vast majority of people who use their bathroom facilities at work do not have their fingers drop off, or noses explode or display any other kind of supernaturally negative health effects. Gastrointestinal viruses can cause stomach ailments, and include such nasties as norovirus (Winter Vomiting Bug). These can remain on a solid surface for as long as 7 days. Enteric pathogens, like salmonella, shigella, campylobacter and E. coli, which killed four children and caused a lot of illness at Jack-in-the-Box restaurants in California in 1993. Skin and respiratory organisms, such as staphylococcus aureus (Golden Staph) and Group A Strep – the “flesh-eating” bacteria. Other residual fungi, especially if workplace facilities include showers. 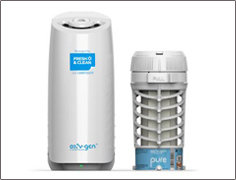 These do not cause illness themselves but can aggravate asthma and allergies in workmates. In 2011, an estimated 16 holidaymakers successfully sued a cruise line company, Fred Olsen Cruise Lines, after falling ill while on-board the ship the Boudicca. Passengers had expressed concerns about hygiene procedures, pointing to inadequate cleaning of public areas. It is believed they contracted the Norovius and developed serious gastric problems as a result. The Boudicca was associated with more than 200 cases of similar illness problems between 2009 and 2013. That’s surely enough to prove that good hygiene is essential in shared facilities, which in turn only emphasizes the importance of following good workplace bathroom etiquette. So what exactly should you do? What steps will send the positive message to workmates and help ensure their working environment is kept hygienically clean too? and the other that highlights good hygiene practices to ensure you and your workmates do not suffer any negative health issues as a result of poor bathroom practices. The workplace bathroom exists for specific purposes, neither of which (we’re sure) we need to explain in any great detail. But there are certain things that are not appropriate – the most obvious being conducting business. Let’s face it, no-one is on top of their negotiating game when they are immediately concerned with… erm, evacuations. So, any attempts to seal a deal are not going to go down well. At best, those involved are going to feel uncomfortable; and worst, the deal will be lost completely. So, inform your employees to leave the business for the boardroom and keep it clear from the bathroom. Admittedly, there was once a time when no-one would bat an eyelid if they noticed a person not washing their hands, but those days are long gone. The vast majority of people consider it as essential as closing the cubicle door, and as such has become an essential part of proper workplace bathroom etiquette. The reason is hardly surprising, with a multitude of surveys underlining the links between poor workplace hygiene and the spread of illnesses and disease amongst workmates. And yet, there are still those workmates that feel they can get away with not cleansing their hands after using the facilities. This is something that many people are concerned about. 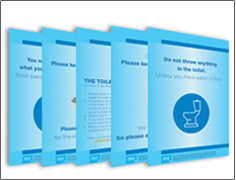 Here are some useful posters that you can add in your washrooms to boost workplace wellness and hygiene. 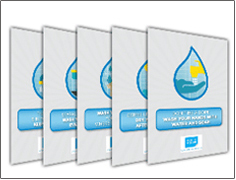 Free posters to discretely remind everyone to maintain good hand hygiene at work. Toilet cubicle posters with catchy and witty messages. Download and use for free. Fun and unconventional gender sign posters to enhance employees’ washroom experience. In fact, according to a 2008 SCA Hygiene Report, which involved over 4,800 participants in 9 countries – France, Sweden, Germany, the UK, Russia, China, Australia, the US and Mexico. The biggest concern over hygiene was firmly set around toilets and bathroom etiquette. 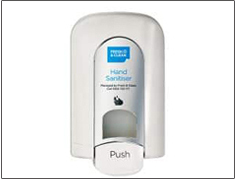 Some 47% of people confirmed they were worried about insufficient hand hygiene in connection with toilet visits. That was just ahead of concerns over hand hygiene when preparing food or meals (45%), and the improper handling of groceries during food preparation (38%). Concerns over whether the toilet or bathroom is regularly cleaned the 6th biggest concern, with 25% admitting to having them. 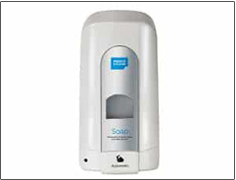 Convenient and regularly replenished soap dispensers. Easy to use. Hygienic. 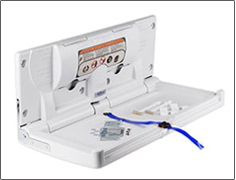 Both manual and automatic dispensers available. Potent disinfectant & moisturiser. 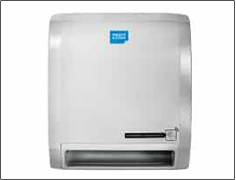 Paper towel dispensers and wall mounted air dryers for any washroom. We’d be willing to bet a lifetime supply of Vegemite you hate to visit your own workplace bathroom and come face to face with a mess – so why would you think it’s different for anyone else? You know what we’re talking about. You enter a cubicle only to be greeted with a toilet seat clearly used for target practice, a bowl that has not been flushed, or floor that has been used as an open landfill site. It’s only because of the selfishness of the previous occupier that such a state exists, and there is no reason why you should leave such a greeting for the person who follows you! In another survey carried out by University of Arizona professor Charles Gerba, found that about 20% of toilets in airport public bathrooms had significant colonies of E. coli, while 30% of sinks and other surfaces regularly touched by bathroom visitors, like flush handles and tap handles, had them too. Why? Because bacteria thrive in moist environments, so an unwiped surface around the sink is ripe for colonization. Of course, it would only have taken a minute to put the mess right. After finishing, it is important to wipe down the seat with a little toilet paper, flushing it away. If some paper drops on the floor, it should be picked up. It’s a simple as that. Around the sink bowls, where water might splash around the edges onto the benchtop, it is easy to wipe it down using the paper towels from the dispenser nearby. It’s hardly a major undertaking, but plays a big part in showing respect to other co-workers as well as in maintaining hygiene levels. It’s not generally pointed out, but flushing with the lid of the toilet bowl up cannot be considered a best bathroom practice. Flushing with the lid up ‘aerosolizes’ bacteria that can spread disease, most notably diarrhoea-causing Clostridium difficile, which can be found abundantly in public, hotel, restaurant and workplace bathrooms. A study from Leeds General Infirmary, and published in the International Journal of Hospital Infection, revealed that the bacteria is sprayed around 25 centimetres above the toilet bowl with each flush, caught on a plume of rising air. The research also showed that the presence of the bacteria was 12 times greater when flushing with a raised lid than when the lids are down. Perhaps most revealing is the fact that the highest numbers of the bacteria was recovered immediately after flushing and, while in significantly reduced levels, was still present in the air after 90 minutes, leading to surface contamination throughout the immediate environment. 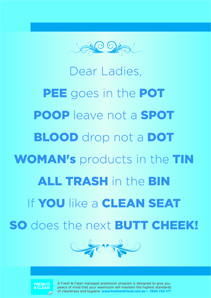 Therefore, it is important to sanitise the toilet seat before and after using it and to always flush with a closed lid. There is an unwritten rule of bathroom etiquette that suggests a person should never hang around waiting for their turn. It might seem strange, but it is loosely associated with the age-old condition, commonly referred to as ‘stage fright’ or ‘shy bladder’, now a recognised medical condition known as paruresis – check out the Paruresis Association of Australia. #Paruresis goes beyond simple shyness, embarrassment, fear of exposure, or fear of being judged for not being able to #urinate. Basically, no-one likes to feel rushed, so when it comes to performing either on the throne or at the urinal, knowing someone is waiting and (maybe) watching becomes debilitating. In the end, feeling irritated and frustrated, a co-worker will emerge slightly embarrassed but more than likely particularly angered. So, it’s best to give them sufficient space by simply going back to the desk or workstation and then return to the bathroom after a few minutes. Alternatively, a person should go to another bathroom on another floor (if possible). Even if you are the owner of the business, or a multi-billionaire, and have a few thousand people working under you, the idea of executive privilege holds no water in workplace bathroom etiquette. Well, let’s face it, there are few places more supportive of the principles of equality of all than bathrooms where billionaire and janitor share the same, erm… shall we say, ‘human experiences’. In that light, you have no grounds to expect lower ranked employees to give way to you, nor that you are entitled to skip any aspect of hygienic bathroom etiquette. So, make sure to flush with the lavatory seat down, wash your hands adequately (and dry them! ), and don’t seek to do any business other than what the bathroom is there for. We already discussed the fact that some people simply cannot use the toilet properly if there are too many people in the washroom with them. Therefore, any kind of talk that goes beyond a simple nod, greeting and a smile is uncalled for in the workplace washroom. Keep it short. This goes for talking to others via mobile phones, as well. Texting, talking, or even playing games. All mobile devices should be kept in pockets, bags or even back at the workstations. Perhaps you already heard that mobile phones are packed with bacteria and that they should be cleaned regularly. Now imagine all those bacteria stuck on your employees’ hands, combined with the toilet bacteria. That is a lot. It is a health hazard waiting to happen. Not to mention, if a person is playing with their phone, they are more likely to forget to wash their hands. Remember, there are much more diplomatic ways to get the etiquette message across to your employees than confronting them directly. A good one is to have workplace bathroom etiquette posters clearly displayed inside that your employees cannot fail to note. Probably one of the least considered options in respect of workplace bathroom etiquette is what’s known as the ‘courtesy flush’. For those not au fait with the term, it’s when a flush is administered midway through an, erm… term on the throne. The purpose is to remove bad odour as quickly as possible by expelling the offending matter from the scene. In reality, there is nothing else that can be done about such things, but letting the smell linger can make a trip to the toilet extremely unpleasant for your co-workers. Besides this, a workplace washroom can have good odour control and regular cleaning to prevent dirt buildup which makes the odour more intensive. Create a pleasant workplace washroom with various scents. Ensure daily freshness. Maintain your workplace washroom odour-free and spotlessly clean at all times. Prevent bacteria from spreading and causing bad washroom odour. Sanitise it. Admittedly, there is an issue with eco-friendly principles, with such courtesy increasing water use. According to the EPA, as much as 22.7 litres of water is used with every flush, though more modern toilet models use less – just 6.1 gallons. But it is the best of a bad lot. Having read our 8-point guide above, you can feel confident of doing your bit to making your workplace that bit happier and safer, at least hygienically. Of course, the Greenroom is dedicated to spreading the ideas and news that can make your workplace cleaner and greener, and through Alsco’s own workplace hygiene branch, Fresh & Clean, our clients can successfully enhance the degree of workplace bathroom hygiene significantly. Fresh & Clean offers fully managed hygiene and washroom services rental programs throughout Australia. This can be custom-designed to suit a specific workplace based on a number of criteria, like its operations and staff numbers. Services and products provided include feminine hygiene, odour control, soap dispensers, hand-drying systems and cleaning. Create a positive environment and establish good washroom etiquette. Contact Fresh & Clean, and discover the products and services that can help your workplace bathroom become a haven from harmful bacteria and associated illnesses, feel free to check out the Fresh & Clean website.